When in the small german Town of Winden kids start disappearing it looks as if something that happened 33 years ago is repeating itself. A Netflix Original that is often compared with Stranger Things, but then Darker. A very sophisticated Time Travel series. Where can you stream Dark? 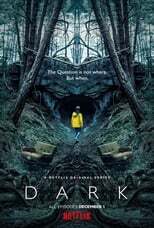 On 2017-12-01 Sci-Fi & Fantasy/Drama TV Series Dark first aired on Netflix. Written and created by Baran bo Odar, and produced by Wiedemann & Berg Television, Dark will return and was last broadcasted on 2017-12-01.